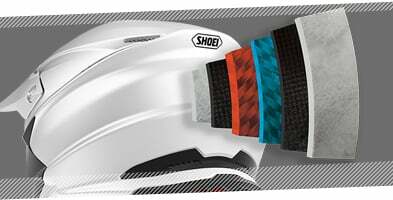 Get ready for the Evolution of an Icon, the all-new Shoei VFX-WR Helmet, the next iteration of the popular VFX-W. The VFX-WR's liner incorporates the unique M.E.D.S. 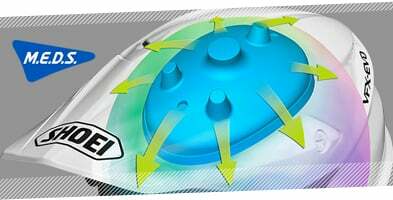 (Motion Energy Distribution System), a specially inserted module of the EPS liner designed to absorb sudden impacts by reducing rotational acceleration to the head in the event of a crash. Shoei's in-house testing showed rotational energy to be reduced by 15% in comparison to that of the VFX-W off-road helmet. The shell is constructed with high performance AIM+ (Advanced Integrated Matrix Plus Multi-fibre), a combination of fibreglass and organic fibres. The result is a rigid, ultra-lightweight, yet elastic structure. The mud guard is specially shaped so as not to interfere with the wearing of goggles. Dedicated plastic tabs help hold the mud guard firmly in place during serious off-road riding conditions. The braced nose cover has been designed to improve safety: it features mesh to filter dirt and dust, and aluminum mesh to prevent roost from entering the mouth and is easily removed for cleaning and maintenance. 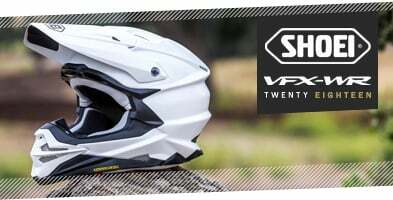 The VFX-WR's newly-designed, adjustable peak designates the top position on the helmet as default, based on the preference of many top-ranked riders. A straight line is formed from the visor top to the helmet shell to ensure upward visibility. The adjustment system is facilitated with a special screw fixing nut, installed beneath the upper center of the visor, holding it firmly in place and keeping the nut from coming loose and falling into the helmet. Shoei's VFX-series has been leading the off road helmet industry with it's bold, innovative design and exceptional safety features for years - with the introduction of the new VFX-WR, the bar has once again been raised for what is considered to be premium head safety. Simplifies helmet removal by removing the cheek pads in the event of an accident.